I’ve been talking with a gluten-allergic friend of mine for a while about making gluten-free, dairy-free pizza. The idea popped into my head again yesterday, and as I was contemplating gluten-free options, I thought of polenta as a base instead of wheat crust. I hadn’t made polenta in years, but the thought stuck and I decided I was up for a little experimenting. I used a very basic polenta recipe from The Clueless Vegetarian and mixed in a bit of vegan parmesan near the end of its cooking time. 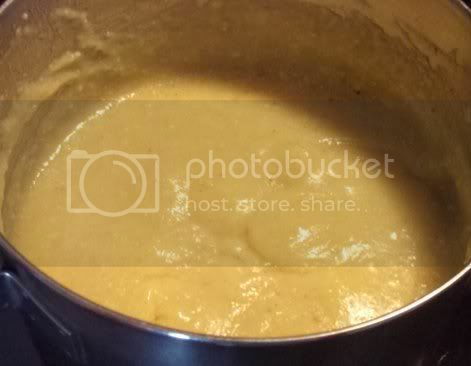 It took longer than I expected, so I think next time I’ll have to simmer it at a slightly higher heat. Some garlic would make a good addition as well. 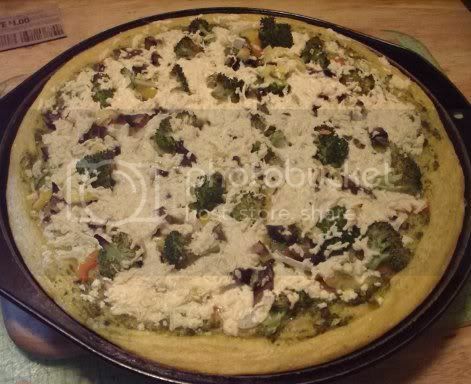 When it was done, I spread it out in a pizza pan and let it set a little before putting some pesto, veggies, and Daiya on top and baked the whole thing the same way I would a traditional pizza. The end result wasn’t quite what I was expecting, so there’s no polenta pizza recipe yet, but there will be more experimentation to that end in the near future! I’m thinking of putting the polenta in a pie plate instead of a pizza pan next time, chilling it to set it a bit more, and pre-baking it before adding toppings. I’d forgotten that polenta is kind of sloppy when it’s warm, so the pizza came out in piles of cornmeal instead of slices. The concept is a good one, though. I’ll be working on it more when I restock the cornmeal. Since polenta is a lot lighter than traditional pizza crust, I threw together a quick side salad that I am happy enough with to share the recipe. I didn’t really measure anything, so the amounts are approximate. 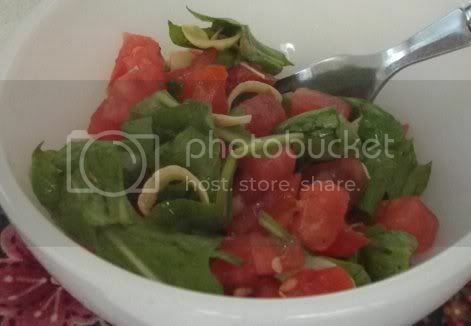 This salad is pretty versatile…add more or less of anything to your taste, or make a huge bowl to serve more people. Throwing in a few chickpeas and maybe some leftover cooked grain would turn it into a good lunch. As always, the fresher the produce, the better. 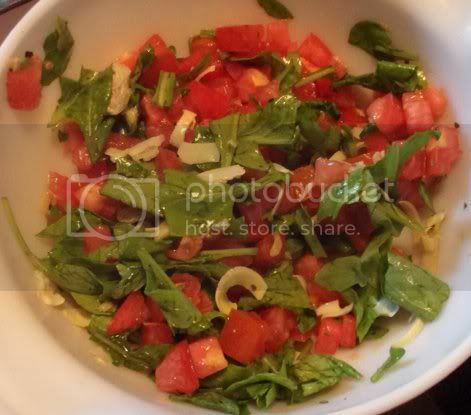 I used farmstand tomatoes and farmer’s market arugula…yum! Combine vegetables in a small bowl. Add herbs and oil. Toss to coat. Chill until ready to serve. 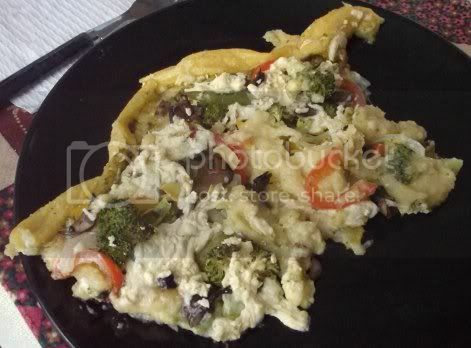 I made this polenta pizza a little while back http://blog.fatfreevegan.com/2008/01/personal-polenta-pizza.html and it was a bit too soft for my liking too. I think maybe it’s just how polenta is, unless you cook it really thin perhaps? Or maybe bake the base for a bit before adding the toppings to get it crisper? Looks yummy anyway as does the quick salad.